We wanted to start the New Year with a quick recap of some of the projects we worked on and completed in 2016. 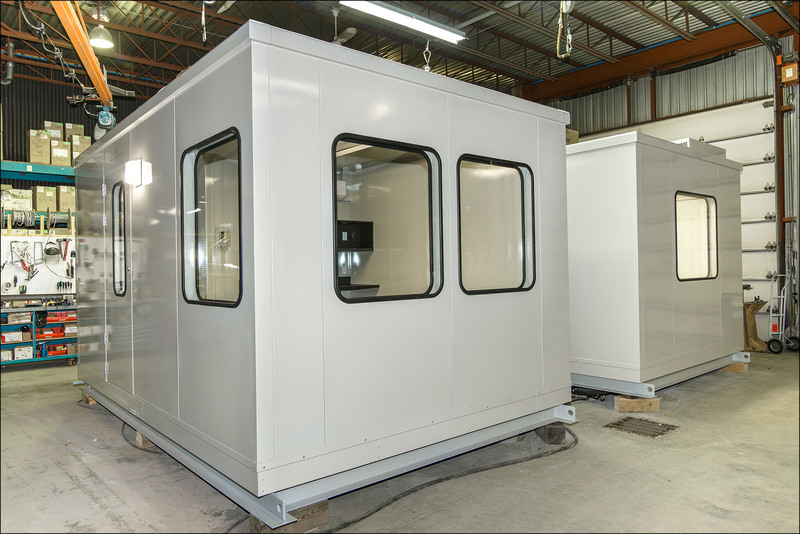 MECART’s pre-engineered modular acoustic panels can easily be configured and assembled into buildings, booths, cabins, enclosures, acoustic screens and barriers as well as silencers to provide sound and vibration attenuation for both indoor and outdoor industrial noise issues. Here is an overview of some projects completed in 2016. The client needed a turnkey pre-assembled cabin and wanted it to be installed with one half outdoors and the other half indoors. Yet another particularity of this project was its interior soundproofed wall partition, which served as an acoustical barrier insulating both rooms from one another. Sometimes, my job makes me question the client’s initial design request and suggest improvements to better suit the company’s needs and constraints. By redesigning the HVAC system from the initial client design, we saved our client 25% of the total initial project costs. 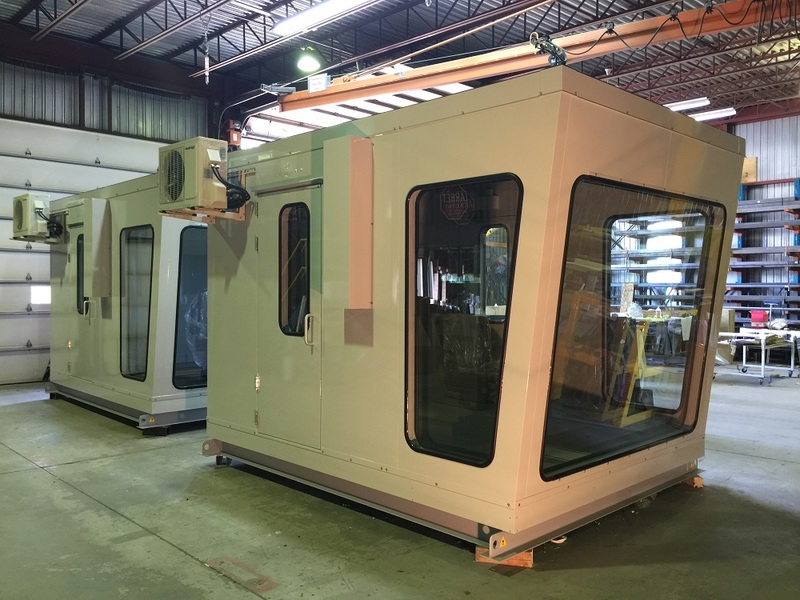 These pre-assembled operator cabins are for a plant in the pulp and paper industry in Southern USA. The operator’s visibility was important so we used an inclined window at the front of the cabins. Most importantly, they are STC-45 with a 100% integrated and non-apparent HVAC system. 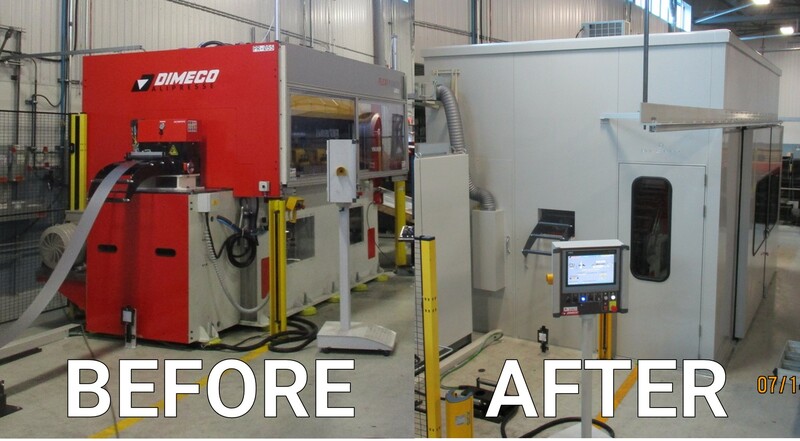 This acoustic enclosure for a metal press machine achieves a noise reduction of about 35 dB. The enclosure is also equipped with a ventilation system with a fresh air intake and air conditioning. The sliding doors of 11′ by 8’ are 100% custom made. This paper mill wet lab with 180 degree panoramic view includes a steel work surface with integrated stainless steel custom sinks. The noise level required a soundproofing of STC-45. Due to anti-vibration requirements, a special frame was engineered and cushions were added. The modularity of Mecart’s system allowed our installers to set up the room in less than 10 days. 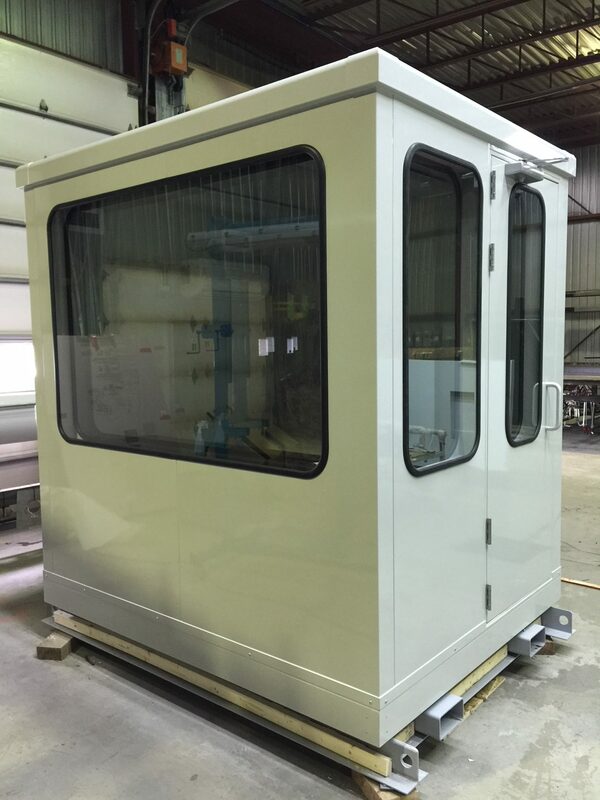 This small cabin was pre-assembled at our plant for a foundry. It has a noise reduction of 45 dB, multiple lifting points (by lifting or by forks), an integrated work surface and a ventilation system with a fresh air intake and air conditioning. This is a perfect example of projects we regularly work on. As you can see on the “before” photo, this client was in desperate need of a new control room for his workers. Not only was the room too small but the level of soundproofing was inadequate. The client also wanted to give his operators the best possible visibility over the production line. These two modular buildings were built for a cement plant. To avoid corrosion with the chemicals found in the plant, no aluminium components were used. They both come with an air unit (HVAC) with washable filters and self-contained A/C wall units. 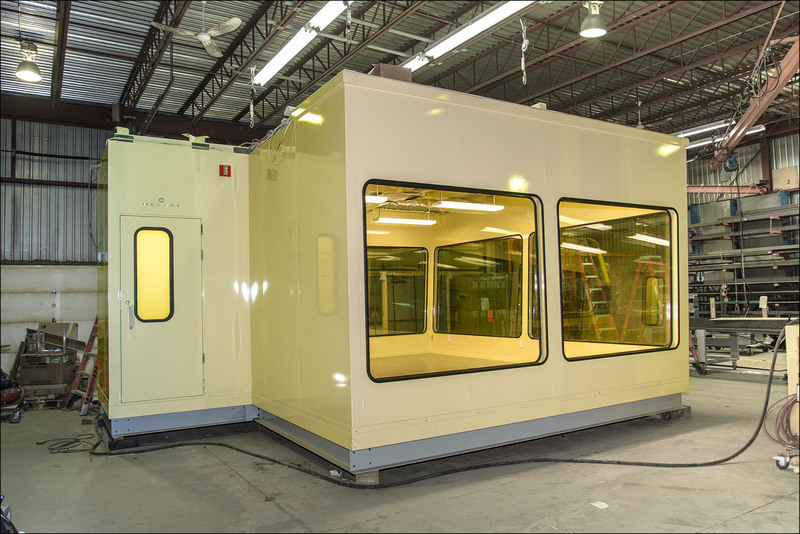 Since the cabins were pre-assembled at our plant and delivered in one module, the design integrates the appropriate structure with lifting eyes. 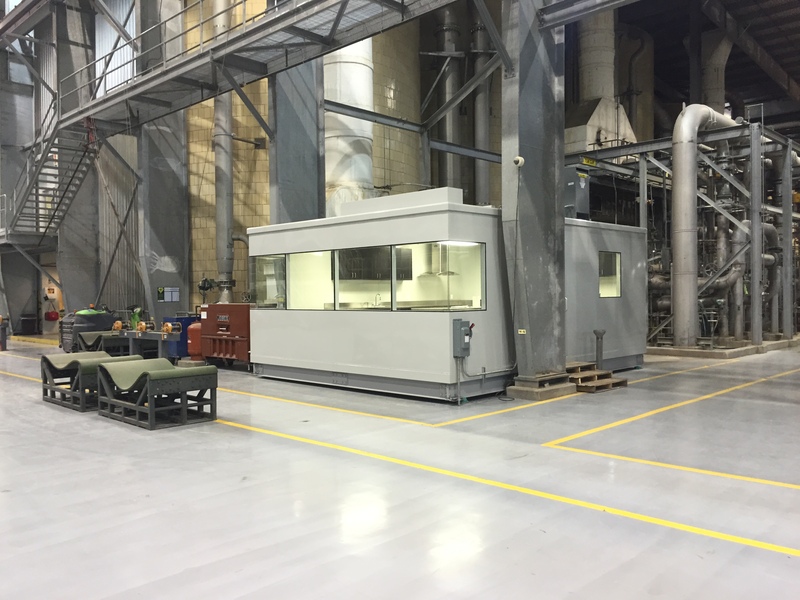 This control room will be used in a steel manufacturing plant, with resistance to heat being an important characteristic. The inclined facade with a heat proof system over the windows prevents the radiant heat from penetrating and causing discomfort to workers. The cabin is equipped with a complete fire protection system connected to the plant’s main system. A fire alarm panel is also integrated into the control room walls, as well as network and electric utilities. Due to transportation limitations, the cabin was pre-engineered and pre-assembled in two sections (airlock + room). The cabin also meets acoustic performance (STC-45). Do you have a similar issue in your plant? 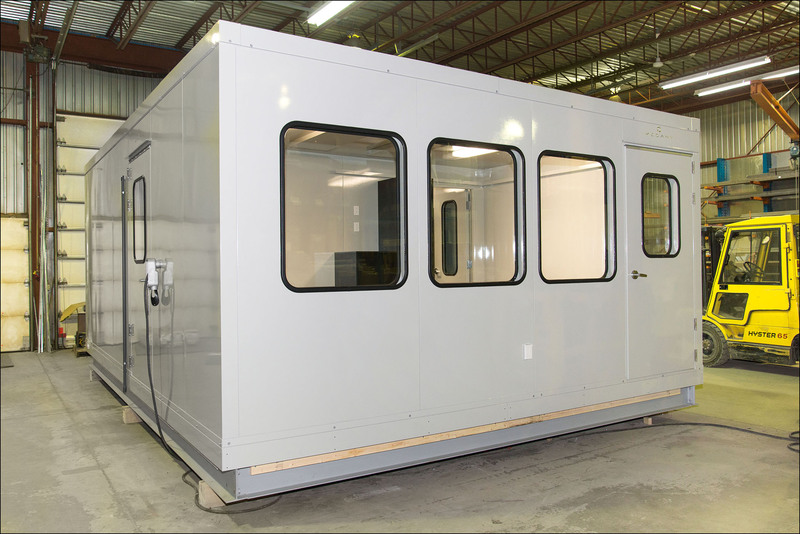 MECART modular buildings are custom-made to your needs. Our team of experts can find solutions to any challenges your project might be facing. The more difficult the challenge, the more fun we have solving it. Contact us and we will be more than happy to see how we can be of help with your project.